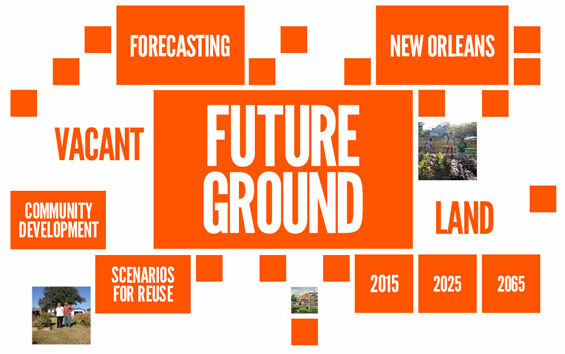 Van Alen Institute recently announced the international competition Future Ground, and is now accepting submissions from professionals in landscape design, architecture, planning, public policy, and other related fields to develop innovative strategies for vacant land reuse in New Orleans. The competition is supported by the New Orleans Redevelopment Authority (NORA), which owns over 2,000 vacant lots and has become a regional and national leader in reuse of vacant lots for community resilience and development. Approximately 30,000 empty lots and abandoned structures dot the landscape of New Orleans today, many of them a legacy of Hurricane Katrina. As the City nears the 10-year anniversary of the storm, Future Ground will generate flexible design and policy strategies to forecast and accommodate changes in density, demand, climate and landscape in New Orleans over the next half-century, thereby transforming these abandoned landscapes into resources for the near-term and future city. “Future Ground offers a new approach to a persistent challenge in cities around the world. The competition will provide big-picture thinking and implementable designs for New Orleans through robust collaborations between designers and policy experts, and by developing rigorous scenarios for the future city,” said Van Alen Institute Executive Director David van der Leer. “We’re proud that the latest project in our 120-year history of organizing design competitions will help catalyze change, and continues our tradition of producing innovative solutions to complex problems. Teams will be selected from an international open Request for Qualifications process. Applications are due by September 29, 2014, and will be evaluated by a jury of national leaders in design and policy. Each winning team will receive a $15,000 stipend, and will work closely in a six-month collaborative process with local stakeholders and national leaders to bring small, incremental projects to the neighborhood and citywide scale; develop policy to support promising design strategies; and make these strategies participatory and flexible enough to be sustained into the next generation. The teams will produce solutions that may be applied to sites citywide, and can also help catalyze strategies for change in other cities around the world. Van Alen Institute will work closely with the selected teams to leverage this modest stipend to promote their work nationally and internationally and develop networks among the competitions Advisory Committee. An Advisory Committee of local and national leaders in vacant land issues will guide the teams. In addition, teams will work closely with the Futures Team – a group of experts in landscape architecture, demographics, geography, climate change, and real estate from leading academic institutions in the region – to forecast scenarios for New Orleans in 2015, 2025, and 2065. Teams will incorporate these forecasts into their proposals that will include design, policy, financial, engineering, and other strategies. Future Ground is the first of several competitions to be launched as an integral part of Van Alen Institute’s Elsewhere: Escape and the Urban Landscape, a multi-year initiative exploring how both the form and organization of the built environment influence our need for escape. Through competitions, public programs, and research, this unique multidisciplinary effort is bringing together innovators in design, public health, policy, and the sciences to change the way we understand cities.